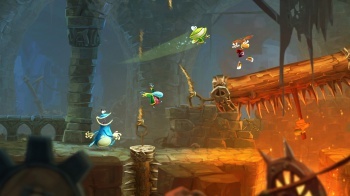 Ubisoft's follow-up to Rayman Origins has been delayed once again, this time until fall 2013. Wii U exclusive Rayman Legends is no longer, um, exclusive. Ubisoft's sequel to Rayman Origins, which was announced for the Wii U during Ubisoft's E3 2012 press conference, was originally supposed to launch alongside the new console. It was delayed a few weeks before the Wii U's launch and pushed to February 2013, which is, according to my sources, the month we are in right now. That means the wait is almost over, right? Well, no, because the Wii U version of Rayman Legends has been delayed until September, when it will also launch for the Xbox 360 and PlayStation 3. In a press release, EMEA Chief Marketing and Sales Officer Geoffrey Sardin cited fan demand as the reason for the multiplatform switch. "We heard from many Xbox and Playstation owners and Rayman fans who told us they really wanted to play Rayman Legends on their current system," he said, adding that Ubisoft wanted to give fans what they wanted while "broadening the audience" for Legends. For Xbox 360 and PS3 owners, this is probably good news, though it's unfortunate for early Wii U adopters. Seeing the former exclusive go multiplatform isn't nearly as big a blow as having to wait another six months to get it. By the time it launches, Rayman Legends will have been pushed back almost a year from its original date. Hopefully that's the end of delays for the limbless hero, and Legends will hit the non-specific "early September" release noted in Ubisoft's press release.